Birth Doula Services serving the Eastern Shore of Maryland, Virginia, and Delaware. What is a Doula? i'm interested in doula support! Having a baby is one of the most exhilarating, joyful, and overwhelming times of your life. The knowledge that you’re carrying your baby and will soon have that baby in your arms is amazing. And all of the unknowns can be overwhelming! You are inundated with horror stories of labor and birth. You’re hoping you can remain calm and be strong. You don’t know what to expect, as you understand that labor and birth can be so unpredictable. You’re not alone: everyone carries fears as they approach their birth. When you enter your labor and birth experience carrying fear, those feelings and doubts come to the surface. It’s such a vulnerable time. And you get to the hospital, get checked in by strangers, meet your midwife or OB, who you may have only met once or twice before, and then are left to yourselves. Maybe you’ve already had a baby before. You probably remember what it felt like at that point in labor when you’re alone or surrounded by people who don’t know you or what you want and need. Heck, you might not even know what you need! The visions of strength, focus, calm, and joyful are out the window immediately. Too many women leave their birth experiences and feel regretful, weak, and out of control. That’s not the way it was designed to be! We weren’t meant to merely survive the most important day of our lives, we are supposed to THRIVE. When Jessica called us a year ago, she retold the story of her first birth. She shared that she felt alone, scared, and ended up making decisions that she didn’t want to make. Although she felt prepared, she and her husband didn’t anticipate exactly what to expect when they got to the hospital, how intense the experience was, and how to handle those feelings. She wanted something different the next time around. Jessica hired us, and we worked with her in her pregnancy to unpack her previous experience and plan for her next one. We got to know each other, formed a connected and trusting relationship throughout her pregnancy, and Jessica felt ready to face this next labor with excitement, strength, and anticipation. When her labor began, she, her husband, and her doula went to the hospital to meet her baby. After getting checked in, the nurses and midwife left them alone. With the help of her doula and husband at her side, Jessica moved through a labor which was intense and full of amazing and funny moments. Unexpected moments happened, as they always do. Jessica and her husband communicated with their nurse, midwife, and doula. Jessica stood, swaying and breathing and moaning through contractions, with her arms around her husband’s neck in a hug while he held her. Her doula sat behind her and rubbed her back during each contraction which relieved so much discomfort and pressure in her lower back. After her baby was born, Jessica smiled brightly and said “That was amazing!”. Doulas reduce fear and instill strength. When you hire a THRIVE doula, you spend two meetings together during your pregnancy to get to know each other and plan for what you want and how you want to feel during this upcoming birth experience. We’re available to you 24/7 when you have questions throughout your pregnancy or when you just need someone to talk to. When your labor begins, your doula will join you, whether that’s when you’re still at home or in the hospital. She will stay throughout the entirety of your labor, providing physical and emotional support to both you and your partner so that you feel comfortable and safe. And when you reach the moment where you say “I can’t do this”, your doula will be right there beside you, to help you dig deeper than you’ve ever dug before and find power and strength that you didn’t even know you had. THRIVE doulas are experienced with hospital birth, home birth, birthing centers, VBAC, natural birth, inductions, cesareans, epidurals, and everything in-between so you can rest assured that you’ll get the level of care that you need. And when that amazing moment comes when your baby is here and in your arms, your doula is there to shed a tear with you, take some photos, and bask in the glory that is a new squishy baby! When you get home with baby, we come back to share the best memories of your experience and help you get off to the right foot with newborn care, breastfeeding, and life as a new mother! Click below to submit a “Free Consultation” form. Maria Mengel, owner of THRIVE, will give you a call to answer all of your questions and schedule a free consultation to meet one of our doulas so that you can start the process of planning for your birth! 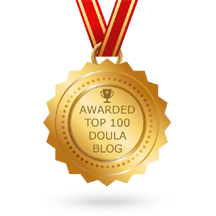 Read our blog post, "What is a Doula?" to learn more. WHAT OUR CLIENTS WANT TO SHARE WITH YOU! "My first son snuck up on us, 4 weeks early. We didn’t even make it to the birthing class. I wanted to be more aware of things the next time. When we found out there was another baby on the way, we decided to have Maria join us on the journey. It felt so good to be able to give a father’s perspective on all of these little details that made my wife so much more comfortable. And the best part? Maria gets to remember these choices and be a calm voice in times of need. Just knowing there was a knowledgeable, comforting woman with us the whole way was extremely powerful. My job was to just comfort my wife and wait for my son." "You will never regret the loving support you receive and the empowerment you find within yourself." "My second birth was amazing in large part because of the support that I had." "As a generally private and independent person, I was not certain what kind of support I would end up wanting and needing during my labor and birth, but it was so comforting to know that Elisha was there for me when I needed her. " " I could not have imagined going through my pregnancy or birth without Maria. I can honestly say hiring her was one of the best decisions I have ever made." "I had awful back labor and without me having to say anything she took the initiative and taught my husband to provide counter-pressure to my back to help alleviate the pain - which was SO helpful! Thank you Elisha for helping to make my labor and birth as peaceful and comfortable as possible!"